Larry Merculieff, BS, has almost four decades of experience serving his people, the Aleuts of the Pribilof Islands and other Alaska Native peoples in a number of capacities. His reach has been broad and varied; a few of the positions he’s held include: City Manager of St. Paul Island, Commissioner of the Alaska Department of Commerce & Economic Development, President and CEO of Tanadgusix (A.K.A. TDX) Corporation, Chairman of the Board of The Aleut Corporation, and the General Manager of Central Bering Sea Fishermen’s Association, one of the six Community Development Quota groups created by Congress to receive fish allocations. 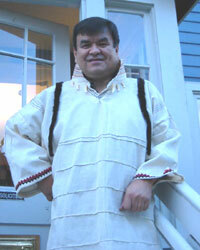 Larry served as the Director of the Department of Public Policy and Advocacy in the Alaska RurALCAP. As Director, Larry led the largest subsistence rights march in Alaska’s history and emceed the subsistence rally after the march. The march was instrumental in protecting Alaska Native subsistence rights that were legally contested by the State of Alaska, to fish for salmon along Alaska’s rivers. Additionally, Larry successfully led a four-year effort to gain federal and state recognition of Alaska Native subsistence rights to halibut throughout coastal Alaska. Larry is co-founder and former chairman of the Alaska Indigenous Council on Marine Mammals; former chairman of the Nature Conservancy, Alaska chapter; the former co-director of the Native American Fish & Wildlife Society, Alaska chapter, co-founder of: the International Bering Sea Forum, Alaska Forum on the Environment, and the Alaska Oceans Network. Larry served as the chairperson for the Alaska Sanitation Taskforce and co-chair of the Federal/State Taskforce on Rural Sanitation to bring support for running water and flush toilets to over one hundred Alaska Native communities. Related to the Bering Sea issues, Larry served on the National Research Council Committee on the Bering Sea Ecosystem, and was one of four Native Americans to present at the White House Conference on the Oceans during the Clinton administration. Close to Larry’s heart are issues related to cultural and community wellness, traditional ways of living, Elders, and the environment. Having had a traditional upbringing, Larry has been and continues to be a strong voice advocating the meaningful application of traditional knowledge and wisdom obtained from elders in Alaska and throughout the world in dealing with modern day challenges. As the Coordinator for the Bering Sea Council of Elders, Larry works with some of the most revered Elders from seven regions throughout Alaska, focused on the health of the Bering Sea ecosystem and the viability and health of the coastal and river cultures dependent on it. Larry has shared Elder wisdom in such magazines or publications as the Winds of Change, YES, Red Ink, Alaska Geographic regional series, Smithsonian, National Geographic, and Kindred Spirits. Recently, Larry was selected by Aleut leaders to be part of a one-hour Discovery Channel documentary about the history and spiritual aspects of Aleuts that was seen by an estimated sixty million people world-wide.